Indie Author Interview -- Emily Guido -- Bonus Link to a Free eBook! 1) What type of stories do you write? Romance, acceptance of people no matter their gender, sexual preference, color, race… “The Light-Bearer Series” is not preachy, but it comes from the premise that we all start in Heaven… and in Heaven, there is no prejudice just Good and Evil. It’s kind of a weird concept because people think it’s religious but they really aren’t. However, you can’t write about Angels and Vampires without a little religious undertone. 2) How do you kick back, relax, and recharge your batteries? That’s funny because I work full time and go to MBA School full time and I write and do self-promos on the side… so, when I want to chill I mostly read to review other Novelists that have asked for reviews. Then if I am really lazy, I watch Jane Austen movies, Supernatural Series, or The Big Bang Theory Series. I don’t watch commercial television only when it’s DVR’d. I hate commercials!!! 3) What’s your favorite wine? Oh I’m such a class act… White Zinfandel on ice! Too Funny! 4) I’m always searching out music for my playlist. What are you grooving to this week? I love, love, love Mullet Rock right now… but I’m a big Classical freak and Love Songs freak, especially 80’s. I’ll check them out. And who doesn’t love 80’s music? I was out dancing and grooving to that a couple of weeks ago. It’s required education, IMHO! 5) If you had a minion army, how would you use them? Huh, wow good question! I would make people treat other people with respect. I know that sound’s cliché but you can’t help a girl for trying to make the world a better place. 6) When you rule the world, what style of dominion will you employ? I don’t’ know if this is the answer you wanted??? Democracy but don’t get me wrong, I think that there are too many fat cats and the poor people need a voice. If you are talking about a Supernatural Police force, I would say Vampires in a New York minute. 7) What’s your personal peak of rabble rousing instigation? Yes, I have been part of a campaign against people stealing author’s books. Not because I’m an author but because it’s wrong to steal. You wouldn’t go to a BMW dealership and steal a car or go to Macy’s and steal mattress, right? So just because authors don’t charge a lot of money for books, why do people think it is okay to steal their intellectual property? However, I was harassed and people I thought were friends turned against me. Oh well, I stood up for what I believe is right. Good for you! Welcome to the official instigator’s club. Please have a cookie. And no, not everyone will thank you for your efforts, but many will. 8) If had to pick any other career, at any period in history with no limits, what would it be? I would love to be an actress. I have acted since I was a kid in musicals and plays. I loved it! 9) Who’s your favorite author? What about their work speaks to you? Jane Austen and I love her subtlety, wit, superb color and contrast in her writing. It is fluid and moving. Now, I am the World’s Most Hopeless Romantic, so that speaks volumes on the subject. But why does Elizabeth Bennet turn the corner in her love for Darcy when she sees Pemberley?? Burning question for the ages… I think Jane was romantic but practical after all? I love how you capitalized ‘World’s Most Hopeless Romantic’ up above, and Austen is a fitting match for your title. 10) If you could hang out with someone famous for a day, how would you spend the allotted time? Truly, and I think you will not understand it but Wollstonecraft. She wrote such twisted and unadulterated story (s). I would love to sit and chat up with her about logic, framing, idea, and progression. She would be fascinating. 11) Tell me about the inspiration for your current project. 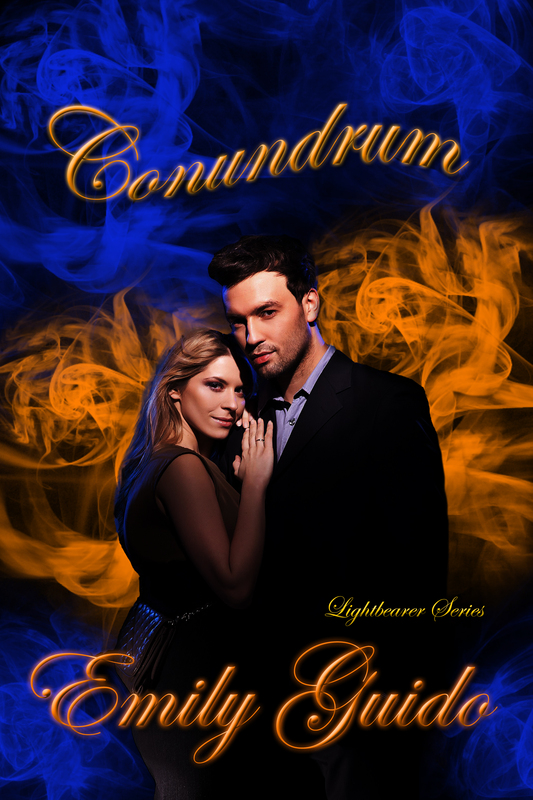 I am writing the sixth novel in “The Light-Bearer Series” which is called “Conundrum,” and it will be freaking awesome! 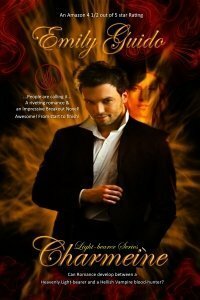 A lot of people don’t know how I can top “Ransom” but “The Light-Bearer Series” is just beginning to kick up some Angel/Vampire dust! 12) Is there a flavor of ice cream you just don’t understand? One that, by all rights, simply should not exist? Haha, and it’s a favorite of a lot of people… coffee… why? I mean I can’t get into coffee iced either. I guess it’s because my Mom was raised by Greeks and I drank coffee as a little girl… always warm or hot. 13) Additionally, what do you consider to be the stupidest fashion trend ever? Board Straight Hair!!! I mean really? Nothing like being frustrated to the max with a hair straightener, so I just gave up. Emily Guido is a new Paranormal Romance Author. She was inspired to start writing “Charmeine” because one day she got an idea of two characters that needed to have their story told. Not ever dreaming a week later she would have over a 100,000 words written. When Emily writes, it is similar to you or I watching a movie. She pictures the characters in her head going through vivid descriptions of each scene. There are so many nuances going through her mind that she cannot type fast enough. The novels “Mactus,” “Accendo,” “Seditious,” and “Ransom,” are the continuation of the wonderful adventures of the inhabitants of The Castle Charmeine! Emily is currently writing “Conundrum” the Sixth Novel in “The Light-Bearer Series” She is currently working at a College full-time, and pursuing her Master of Business Administration.